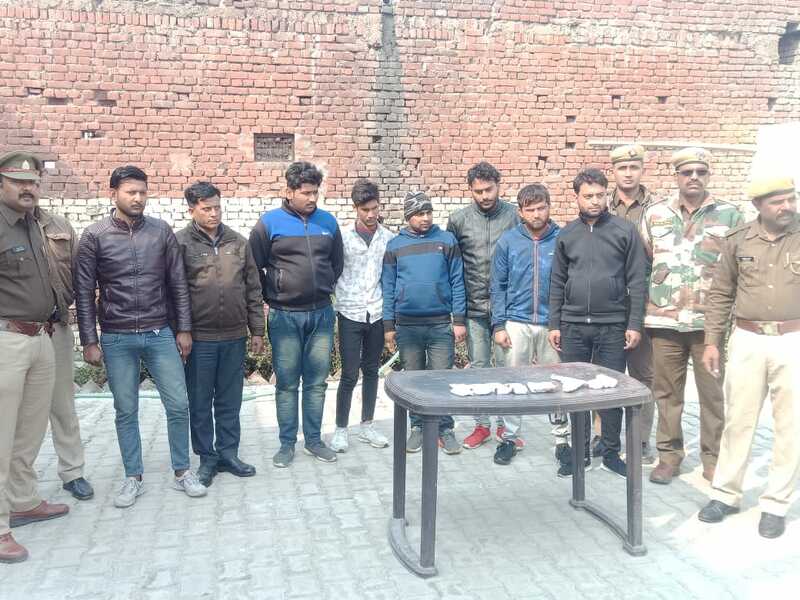 Greater Noida (1/2/2019): Conducting a Major operation Greater Noida police had arrested 8 criminals from the ferocious Anil Dujana Gang. Police had arrested the over a tip of a police informer. As per the information, Dadri police got info from an informer about the movement of these criminals. After that police laid a trap and on the night of 31 January around 11:32 PM police arrested the all the accused Dadri Bypass. Police had recovered a huge amount of arms and ammunition from different gang members. Apart from this one car three motorcycles and 6500 rupees looted in an incident were also recovered from them. As per the police officials, all the arrested criminals are very notorious kind of criminal and were the member of Anil Dujana Gang. Their arrest is a big success for us as if they may not get arrested there is a possibility that they may commit crimes. All the arrested accused were identified as Neeraj, Sumit, Rakesh, Sonu, Sagar, Pawan, Manish, and Chaturbhuj all residents Gautam Budh Nagar and Its nearby Districts. All of them has been sent to jail after being presented before the court.